Schalk Bezuidenhout and Loyiso Madinga are two of South Africa's best dancers, singers, actors and fire breathers. This year, however, they will be focusing on stand-up comedy. Having both started comedy in 2011, they have come a far way in a relatively short space of time. Both comedians were selected by the one and only Trevor Noah to be part of his NationWILD Tour in which he showcased young South African talent, which he thinks is killing it in the comedy world. So if Trevor Noah thinks they are funny, who are YOU to argue?! They have certainly become household names among comedy lovers and with sold out runs of Bezuidenhout’s one man show, ‘Second Language’, as well as Madinga’s show, ‘Born Free-ish’, these two young comedians have started building a fan base that is a lot more solid than their English. And now they are joining forces to make you laugh! 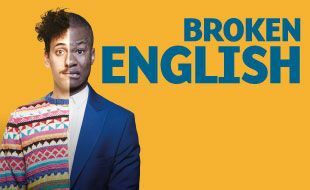 'Broken English' will provide you with more laughs than grammatical errors and is certainly a two man stand-up comedy show that you don’t want to miss!